Email is not intended as a standalone application but is a service that is called up when files and folders are shared via email. To do so, use the context menu in the file explorer or when viewing an album and share the files via email. The system then creates an email message that includes an invitation to view the files or albums with a hyperlink that the recipient can click on. Send Send out email message. 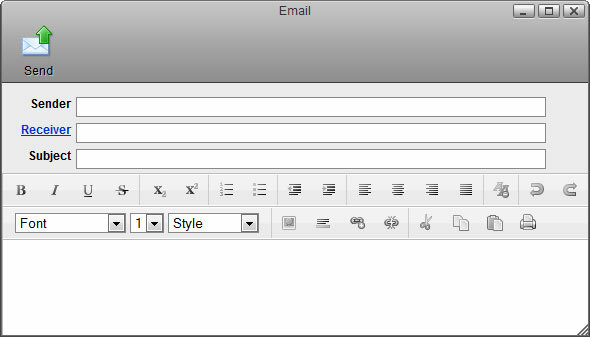 Sender By default, this field is populated with the email address that you have setup under Preferences > Email. Receiver Add Contacts Click Receiver to add contacts from your address book or manually enter an e-mail address. Subject Enter a subject for this email message. To send out invitations by email, make sure to setup the email preferences first. For more details, see Preferences > Email. Bold Convert the selected text to bold lettering. Italic Convert the selected text to italic lettering. Strikethrough Strike through the selected text. Subscript Convert the selected text to subscript format. Superscript Convert the selected text to superscript format. Insert Ordered List Insert an ordered (numbered) list. Insert Unordered List Insert an unordered bullet list. Outdent Reduce the indentation of the line. Indent Increase the indentation of the line. Left Align Arrange the words to the left side. Center Align Arrange the words in the middle of the page. Right Align Arrange the words to the right side. Block Justify Arrange the words to fully fill the lines. Remove Formatting Remove the formatting on the selected text. Insert Image Insert an image at the cursor prompt. Insert Horizontal Rule Insert a horizontal line. Insert Hyperlink Link the select words to a certain URL. Remove Hyperlink Remove the hyperlink from the selected text. Cut Cut out the selected text to move it. Copy Copy the selected text. Paste Paste the text from clipboard. Print Print out the email.